A world class ski resort, Alpe d'Huez offers one of the greatest unbroken verticals in the world. Skiers of all levels are well provided for, whether Beginner or Expert, and the ski area includes some epic, long descents such as the Sarenne. When will it snow in Alpe d'Huez? 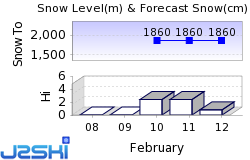 The next notable snow forecast for Alpe d'Huez is 4cm1in, expected on 25 April, with around 67cm26in forecast over the next 7 days. How High is Alpe d'Huez? The French Ski Resort of Alpe d'Huez is part of the Alpe d’Huez grand domaine Ski area with access to 389km242 miles of downhill skiing, with 304 marked pistes, served by a total of 150 ski lifts. In addition to the skiing in Alpe d'Huez itself (236km147 miles of pisted ski runs), the appropriate ski Lift Pass will allow you to ski or snowboard in the other Alpe d’Huez grand domaine Ski ski resorts of Auris-en-Oisans, Oz-en-Oisans, Vaujany and Villard Reculas. The ski resort itself is at 1,860m6,102ft, so skiing or boarding back to the resort is usually possible. With ski lifts as high as 3,330m10,925ft, skiing and snowboarding is assured throughout the season. One of the world's major ski centres, the Grandes Rousses ski area above Alpe d'Huez is a huge and high domain served by an extensive lift system. The resort itself is one of Europe's highest and largest with a massive vertical drop, crowned by the Sarenne Glacier. Built above the original village of Huez, the resort has expanded in all directions over the past 20 years. Today the resort is big and vibrant with far more shopping and 'things to do generally' off the slopes than in most other ski centres, especially by French standards. Architecturally the place is a mix of traditional Alpine chalet style wood and stone buildings, some rather ugly rectangular concrete developments and more tasteful modern construction. There are two huge beginners areas directly above the resort and those going on to the top of the lifts will be able to see a fifth of France, on a clear day, from the top station. The resort has a reputation for both good snow falls and good sunshine with south facing slopes - the area is protected by 900 snow cannon. Alpe d'Huez is one of the most southerly located major international resorts in the French Alps. The longest possible descent in Alpe d'Huez is 16km10 miles long and the most difficult run is the 'Tunnel', which is 16km10 miles in length. The 2230 metre vertical down from Pic Blanc, the highest peak of the Grandes Rousses Massif is one of the largest in the world and leads to some of the planet's longest descents, including the 16km (10 mile) long Sarenne Black run. Beginners might not be too interested in the Sarenne, but they will find the wide slopes immediately above the resort are open sunny expanses with largely gentle gradients. There is also a free lift for first timers use. For intermediates there is almost endless terrain, with some of the best around the slopes of Le Signal d'Homme and the Plat des Marmottes. Passes of six days or longer also include a day or more in several neighbouring resorts including Serre Chevalier. There is also a joint ticket with Les 2 Alpes. Beyond the Sarenne, the longest black in the world, there are nearly a dozen more Black runs above the resort and extensive off-piste possibilities. The Ecole du Ski Français (ESF) in Alpe d'Huez is more than 400 instructors strong and offers tuition in all disciplines and in a wide range of languages. It has a particularly good reputation and regularly dominates the annual 'Instructor Challenge' competition for French ski schools. The International Ski School also operates in Alpe d'Huez and the Mountain Guides Office can arrange a multitude of snow-based activities including off-piste runs one evening a week to a mountain restaurant for a fondue. Cross country skiers have three sign-posted and maintained tracks, the easiest being the Brandes loop leaving from the Altiport. The 10km Poutran loop is classified blue whilst the 'Loop of the Lakes' is graded red and is 20km long. Alpe d'Huez is a very active snowboarding centre with the two major schools giving snowboarding tuition. Snowboarders have the Nature Snowboard Space to themselves - on top of all the pisted and off-piste terrain. Several Snow Parks feature slides, quarter pipes, various modules and a Boarder-Cross course. The resort has hosted the World Snowboard Cup in recent years. The Mountain Guides Office can arrange snowboarding excursions on the glacier and off-piste. When is Alpe d'Huez open? We don't currently have confirmed season dates for Alpe d'Huez. NOTE:- Lift and Piste openings are always subject to Snow Conditions in Alpe d'Huez. Alpe d'Huez is able to make snow, on 62km39 miles of ski runs, with 900 snow cannons. The 85 ski lifts of Alpe d'Huez are able to uplift 94,000 skiers and snowboarders every hour. Alpe d'Huez is in the French Alps in L'Alpe d'Huez, Huez, France. The nearest airports to Alpe d'Huez are Grenoble, Chambery and Lyon Bron. There are seven airports within three hours drive. A variety of events are staged throughout the season, including an ice driving competition in December and a comedy film festival in January. A classical music concert is organised every week. 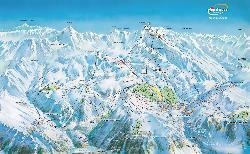 Other Ski Areas within Alpe d’Huez grand domaine Ski. Other popular Ski Areas near Alpe d'Huez. Want to ask about skiing and snowboarding in Alpe d'Huez? Or contact Alpe d'Huez Tourist Office. Note :- The information on J2Ski concerning Alpe d'Huez, where not clearly factual, is opinion only and is neither definitive or exhaustive.